All residential trash pick ups are performed on a weekly basis using our 95 gallon trash carts. Each cart can hold from 8-10 normal household trash bags. Please have your residential cart available for pickup on either the evening before your scheduled pickup or no later than 5:30am on the day of your waste removal service. Our trucks use a mechanical technique that lifts and empties the carts without the drivers leaving the truck. 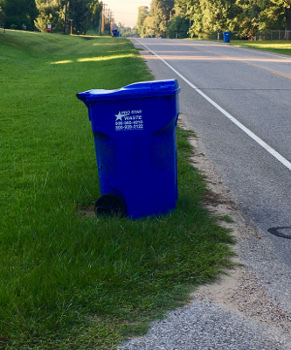 This helps to reduce safety hazards and ease traffic congestion on our residential trash pickup routes. The trash cart must not be obstructed at any time on the day of residential garbage collection. Allow a minimum of three feet of clearance on all sides of the cart from any objects such as trees, fences, mailboxes, streetlights and other carts. Do not park any vehicles in front of the cart. Carts must be a minimum of six feet away from any vehicles. Be sure to place your cart so that pedestrians may still use the sidewalk. Please place your cart on either side of your driveway or at the edge of the curb. Placing your cart at the curb or driveway edge will ensure successful residential garbage collection by our automated trucks. Enter your information to learn more about residential trash pick up services in your area. I am already a Pro Star Waste customer.